Remember when I wrote two posts about blogging? Of course you don't - it was ages ago and so far apart that they totally lost their context. So here's a recap: Act 1 was about how not to hate blogging and Act 2 was how not to let your blog become a monster. Here's Act 3: how not to take your readers for granted. Hold surveys to invite readers to weigh in on the direction your blog should take, the kind of banner it should have, and so on. Write a book and launch a book tour and give dozens of copies away to readers. Bare your soul and show your human side and confide to the entire internet that you're actually a lousy seamstress and your housekeeping skills stink and you feel like you're wading through parenthood blindfolded and with your ears plugged. I've failed you, dear readers. I don't do giveaways much (ever since Blogger upgraded itself and confiscated my comment-numbering function thing), I don't have sponsors, I can't figure out how to do those poll widget things, I sorely neglect my flickr pool because I forgot my password and I keep putting off shoutouts because I don't have the time to surf the net, let alone capture other people's blog images to format into a post. And the book? Uh, we covered that here. Finally, I don't bare my soul because I am deeply mistrustful of the internet. I mean, if it turns people's high school inebriated barfing episodes viral on youtube, can you imagine what it might do to a photo of a dress with ugly armscyes? Shudder! So how do I say thank you for being my readers? For subscribing and reading my drivel week after week? For writing to me with your wonderful, moving real-life stories? For sending me photos of your precious children, nieces, nephews and grandkids enjoying something you made from my tutorials or patterns? For passing along links to awesome cardboard resources and inspiration? For inviting me to visit your blogs to peek at your masterpieces and swoon? At the risk of sounding sorry for myself, let me revisit my favorite cultural issue and beat it to death here. I am an immigrant. I may be quite good at pretending to be unimmigrant-y because I speak English (and only English, sadly). And while this country is now my home, I was born somewhere else far away and I've lived here for less than a decade. As I said in this earlier post, adjusting to my new life and identity here was not at all dreadful (it was quite the opposite, actually) but I grieved a lot in the early years out of sheer disorientation and missing Mum and Dad and stuff like that. Therapy helped, but so did starting this blog. For one thing, it made me feel connected to the entire world, which consequently made Singapore feel not quite so far away. For another, you guys shared your stories, which was like being in a gigantic, remote support group. And, finally, this blog became my new career of sorts (in addition to motherhood). I'm still amazed at how far it's come and at all the different opportunities with which I've been blessed as a result. To anyone who's ever had to work hard to launch anything, this is a fabulous gift. But to an immigrant starting anew in a foreign environment, it is doubly humbling and exhilarating. A blog can only do as much as it has readers to support and carry it, so, logically, I have you guys to thank. And I can't think of a better way to thank you than to teach you more stuff. So... ready for a doll workshop? We're going to be making the felt-haired doll (but with ponytails, because they're simpler) in this workshop, and her dress in the next. I am also in the process of writing the new pdf pattern that includes four more felt hairdos and the yarn hair, four more shoe variations, one more regular, reversible dress and the fantasy costumes: the fairy suit, the mermaid suit and the princess gown. And a carrying bag that transforms into a sleeping bag and storage unit for all the clothes. This way, everyone can make the classic doll and her dress for free and you only have to buy the pattern if you want all the variations and accessories. 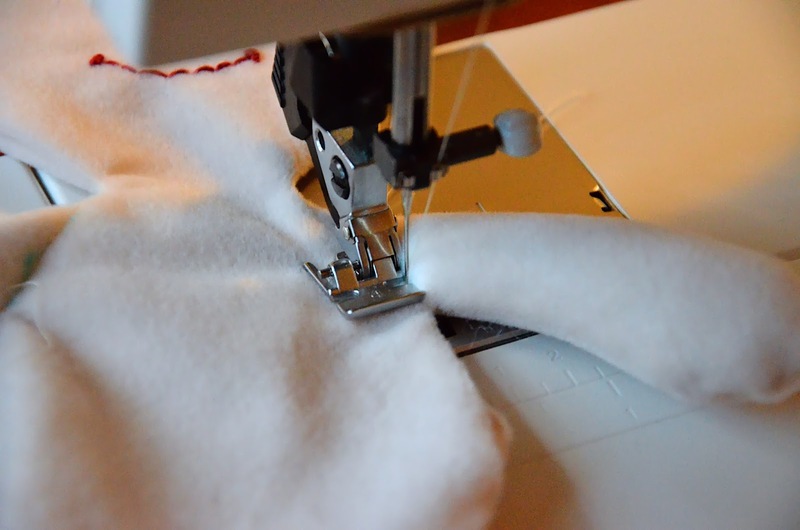 Before we start cutting and sewing, let me show you three pieces of equipment that have helped me sew dolls (and stuffed creatures, in general) more enjoyably. In cooperation with dowels or chopsticks, you can also use your seam ripper or long-nosed pliers like I've used for years, to turn out small limbs. But recently I saw these forceps recommended here in Abby's - Softie Engineer Extraordinaire - shop here and thought I'd pass that tip along. 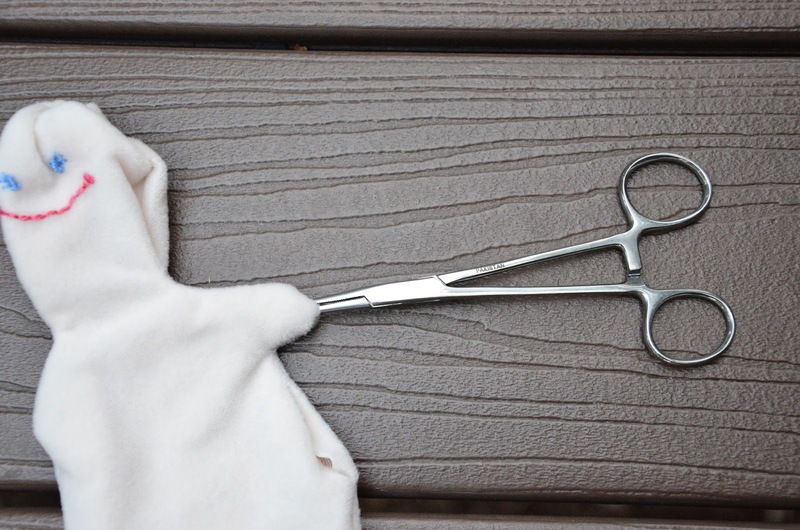 These hemostats have a nifty locking thing that keeps the jaws closed tightly around things without slipping. 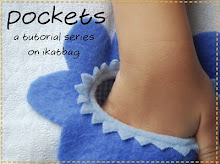 They're also very good for stuffing small corners. I bought mine here. All three - seam ripper, pliers and hemostats are much more useful for turning out small tubes and doll arms and legs than dowels or chopsticks alone. Every household with small children has these, right? 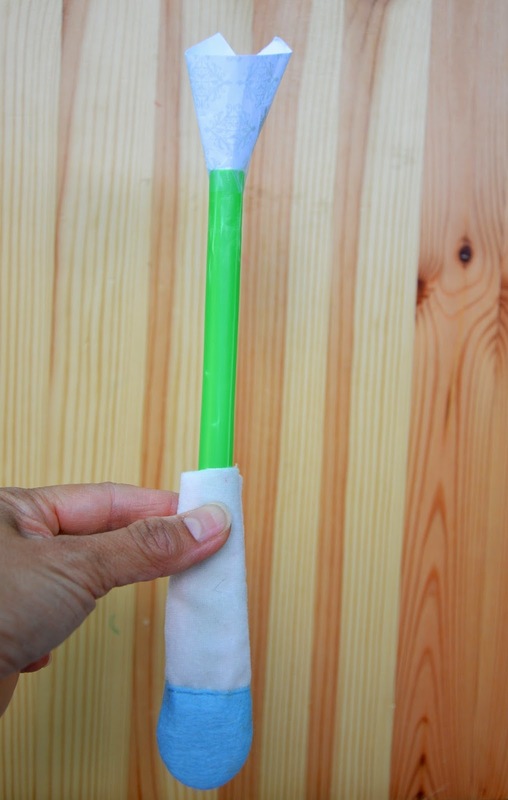 Extremely useful for scooping those poly pellets (or polybeads) into doll feet and bottoms without spilling most of them on the floor the way I inevitably do. And since it's a measuring spoon, you can actually determine the amount of beads you put in one leg so that it's equal in the other. 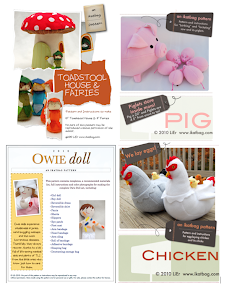 I designed mine out of desperation - I was making more than a dozen dolls for the Fairytale Party (i.e. more than 24 legs and 12 bottoms) and I needed a fast, spill-proof way to get those poly pellets into small, tight spaces. The Contraption is essentially a bubble tea-sized straw with a cone of paper taped to one end for a funnel. You can insert it into narrow places and openings to direct the poly pellets right into their very bottoms. Grandma G, my fabulous pattern-tester, made her own variation of this contraption, and you can see her photos here. I strongly recommend non-stretchy fabric for the doll body and legs because the final product keeps its shape better and doesn't look bloated. Also because the dress as is may not fit bloated dolls and you'd have to make your own adjustments. Some possibilities: no-stretch robe velour (it's not the same as craft velour, which tends to stretch all over the place like thick pantyhose), flannel, cotton. I also do not recommend felt (bulky and hard to work with) or fleece (bulky AND stretchy). 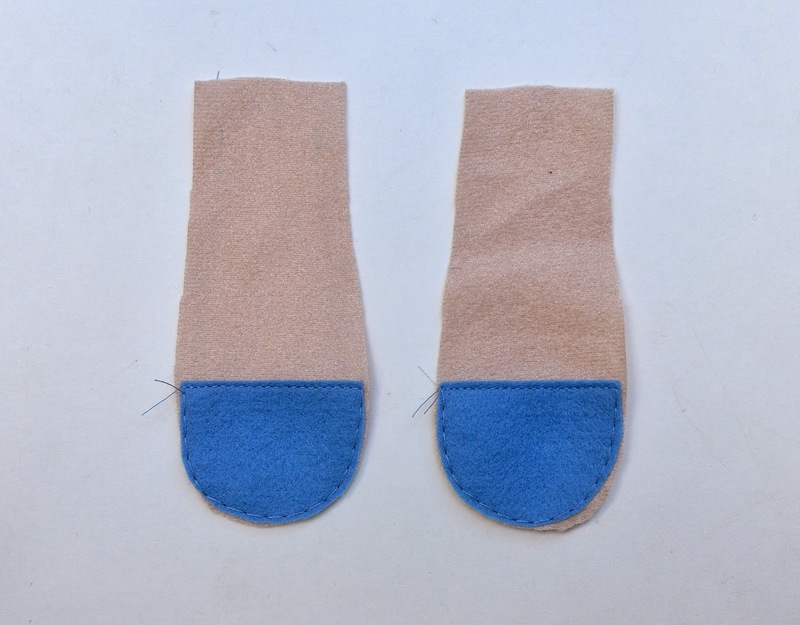 In the templates, I've included arrows for you to align the paper patterns with the selvedge, in case your fabric has a little bit of give (e.g. cotton). For the hair and shoes, I recommend wool or wool-blend felt. Buy these by the yard in limited colors at actual stores like JoAnn, or in 9x12 sheets on etsy. 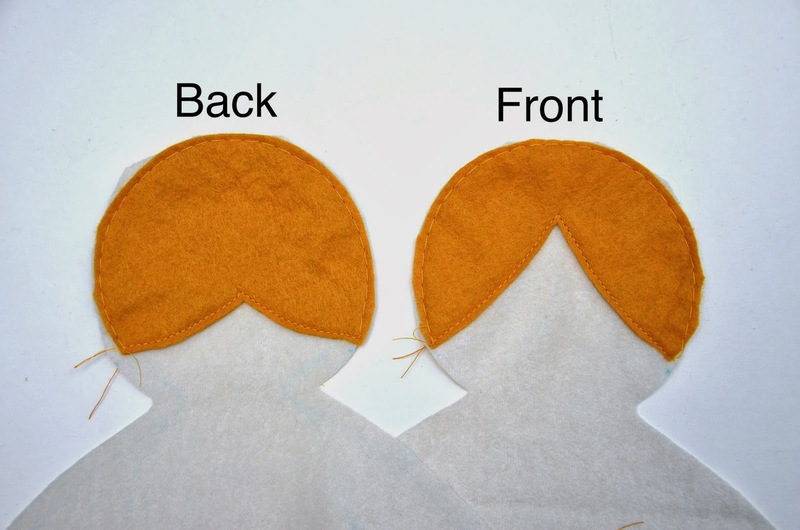 Whenever sewing two small identical pieces of felt together to "double-layer" them (e.g. the ponytails), I often cut one piece to size and leave the second bigger, trimming this second piece to size after it's been attached to the first. You will see this technique in Step 2. 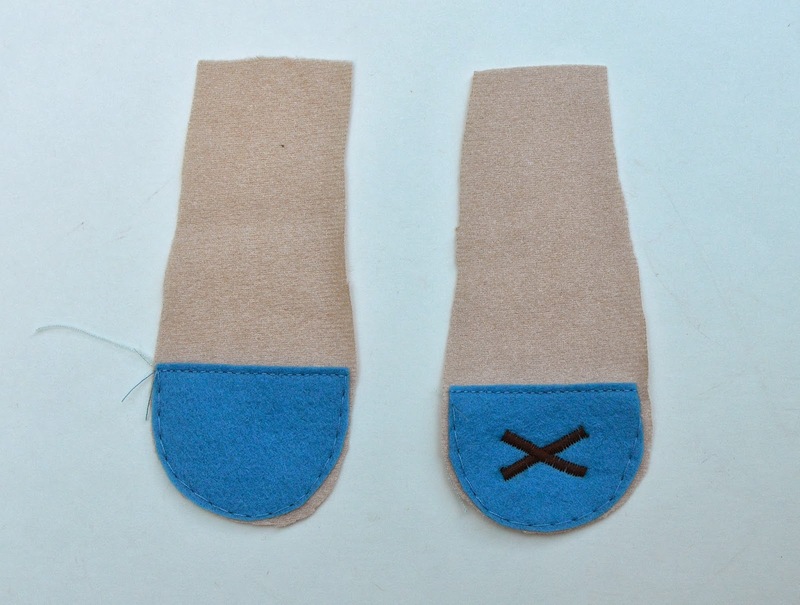 The seam allowances (SA), where present, are all 1/4" for uniformity, and for ease of sewing under the presser foot (you can use the edge of the foot as a guide). 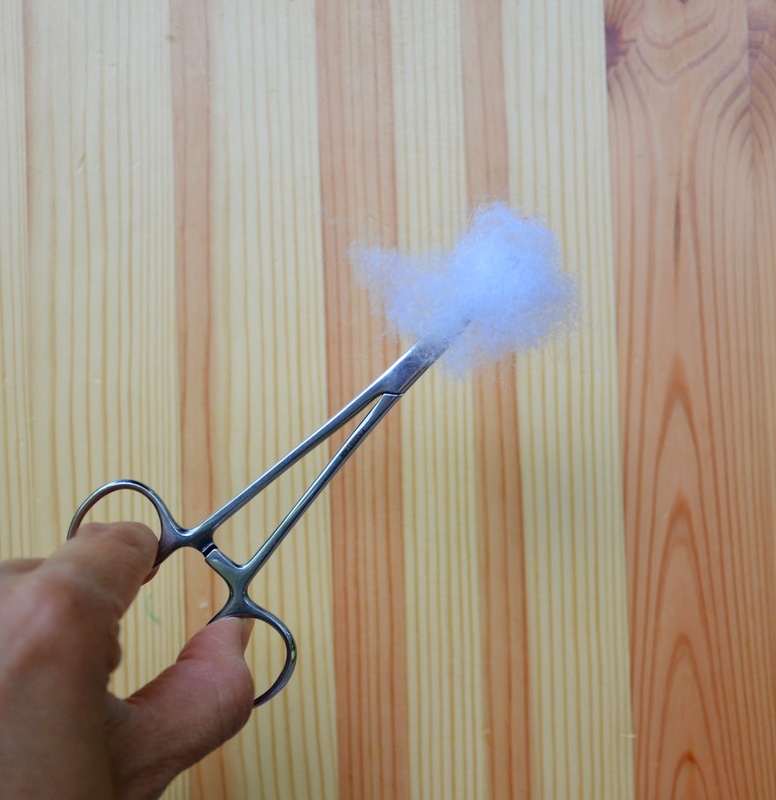 To reduce bulk after the seams are sewn, these SA are often trimmed to about 1/8", or pinked with pinking shears, or snipped. 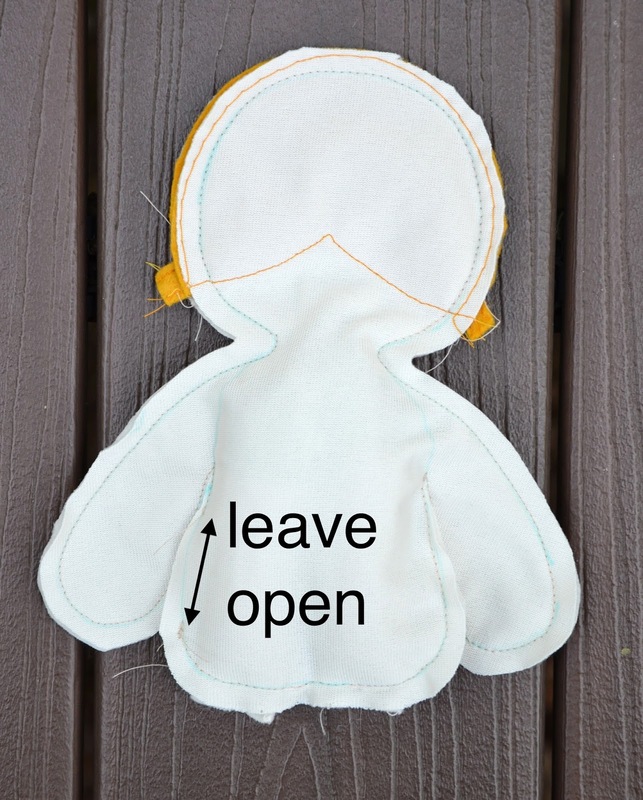 If you've sewn rag dolls before, you might be more familiar with the method of making all four limbs separately and then attaching them to the body-sewn-inside-out. I do this, too, with my larger dolls (e.g. 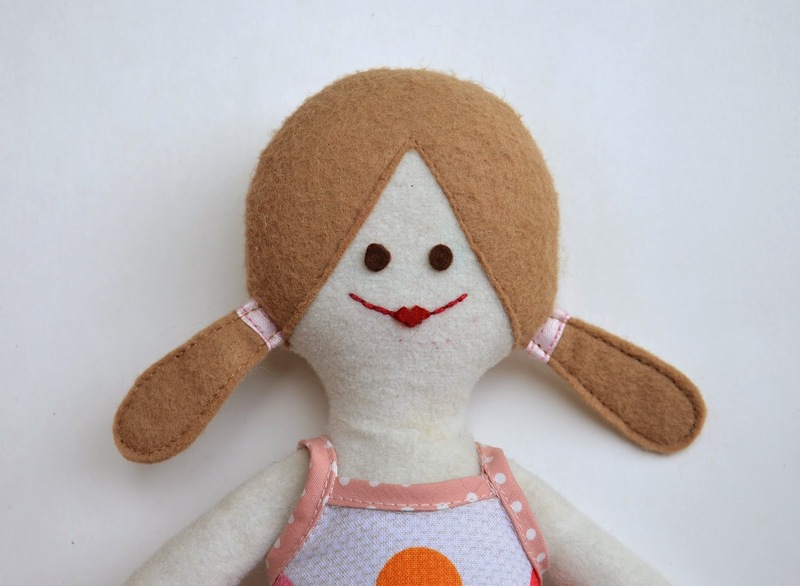 the Owie Dolls) but with this smaller doll, it is easier to make them with attached arms. I'm omitting the more pedestrian instructions like, "Don't forget to backstitch!" 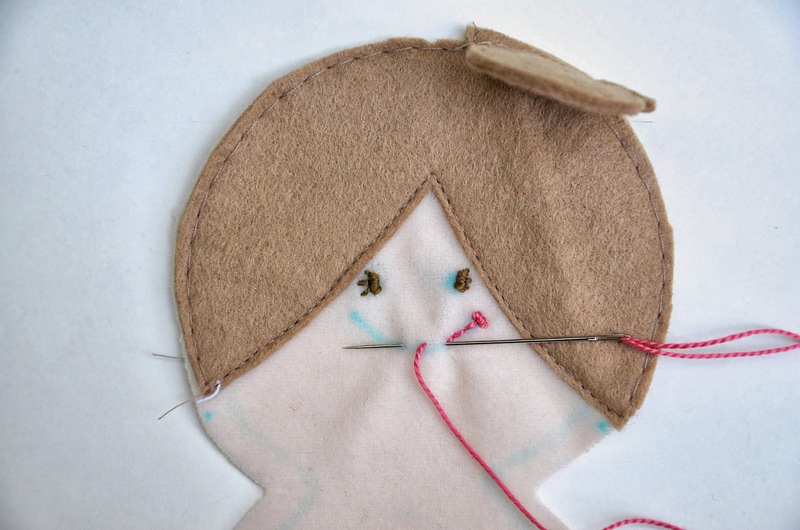 I'm going to assume you know this (and other things) as standard sewing skills. Edgestitch (i.e. topstitch about 1/8" from the edge) the shoes in position to the RS of each leg piece (two for each leg; shown here). I used larger basting stitches to sew within the SA region because it will be hidden later in the seam. You can leave the shoes plain or embellish them. 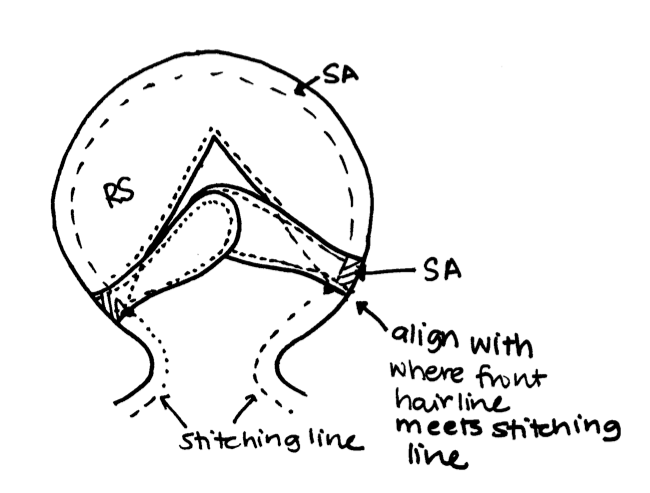 For example, you can sew an "X" in satin stitch (i.e. 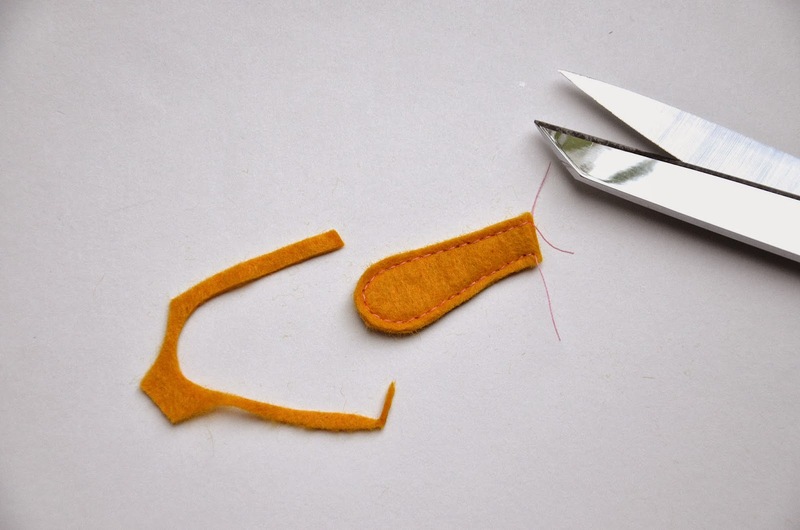 set your machine to the zig-zag function with the shortest stitch length) for laces. We will stick felt buttons on the ends later. Do embellishments (if any) only on the front shoe piece. The back shoe piece is left plain. Now place these two leg pieces together with their RS touching, and sew all around, leaving the top short edges (where it will attach to the body) open for turning RS out and stuffing. 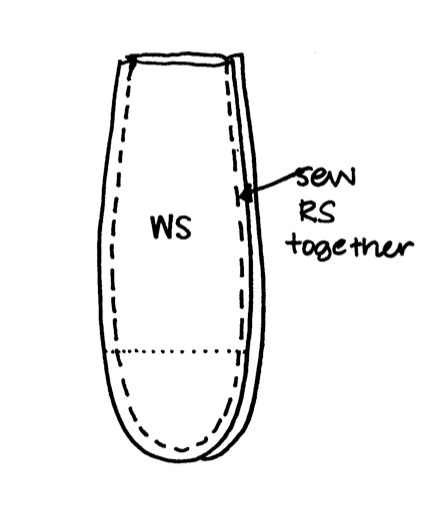 Turn each leg RS out (use dowel, seam-ripper, pliers or forceps). Stuff the two legs - I poured in about 1.5 tsp of poly pellets per leg, followed by polyfill stuffing. Set aside. Edgestitch the hair pieces onto the heads. Again, I used a basting stitch for the parts in the SA. 5-round french knot for the eyes and a single stitch for each of the eyelashes. 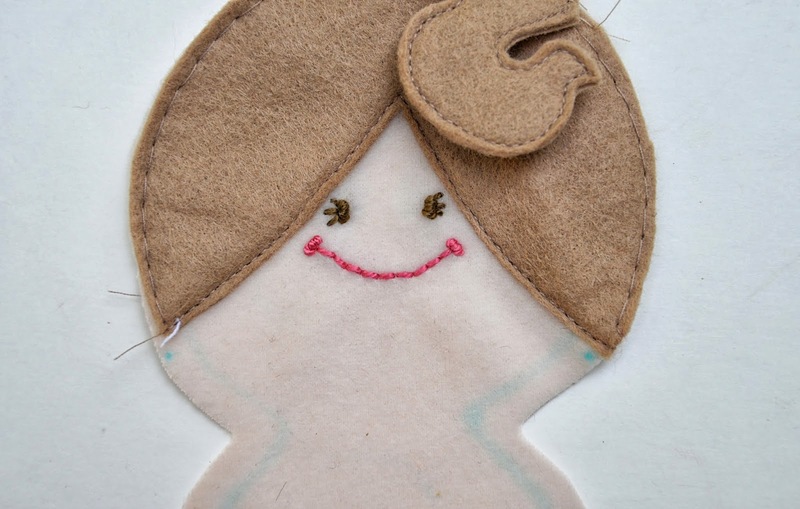 3-round french knot for the mouth dimples and backstitch for the mouth itself. Now, we'll make the ponytails. 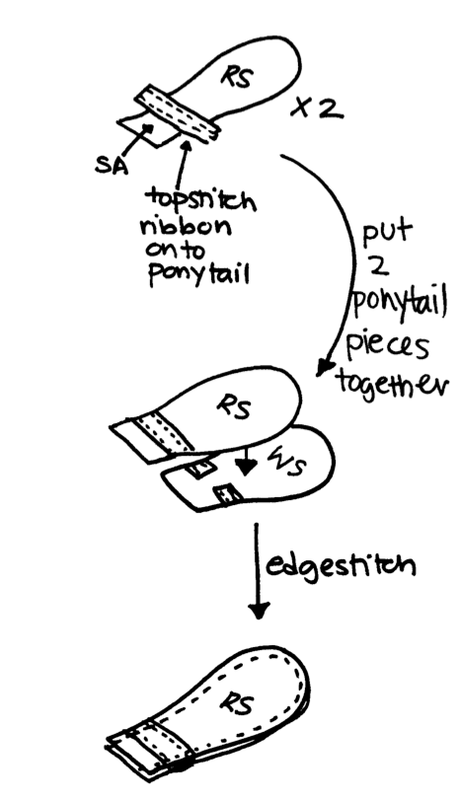 Following the next two photos is a series of diagrams showing how to add ribbons to the ponytails before attaching them to the doll's head so their SA are completely tucked away. This is completely optional; if it looks like too much work, skip it and just make the blank ponytails, then tie ribbon bows to them when the entire doll is complete. Edgestitch one ponytail piece (cut to size) to another (deliberately left bigger). Trim the bigger piece to size. Here is that series of diagrams for that completely optional ribbon step. Feel free to skip it. 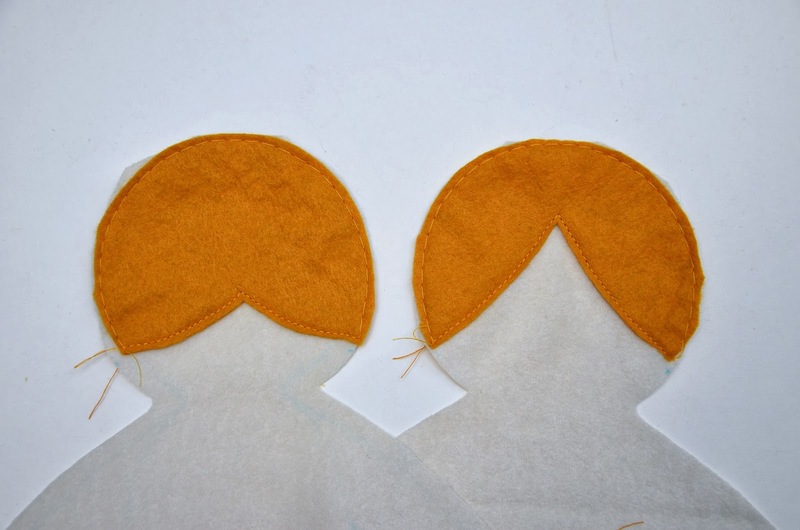 Attach the completed ponytails to the front face as shown and stitch in the SA to hold them in place. Here is the finished hair (ignore this very different face - I was experimenting with stitched vs. glued faces; yours will look different). 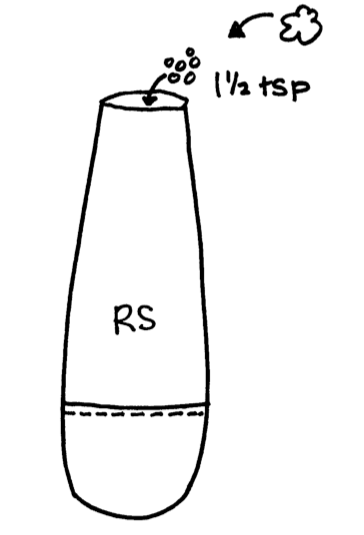 Flip the completed legs upside down and position them with their fronts touching the RS of the Doll Body Front (the one with the face) as shown. Match up points X and Y on the doll legs to those on the Doll Body Front to get the right positions. Baste within the SA to attach them to the Body. Incidentally, ignore the fact that in this photo, the arms look sewn on - they are, because they were part of my earlier trial dolls who had separate arms. 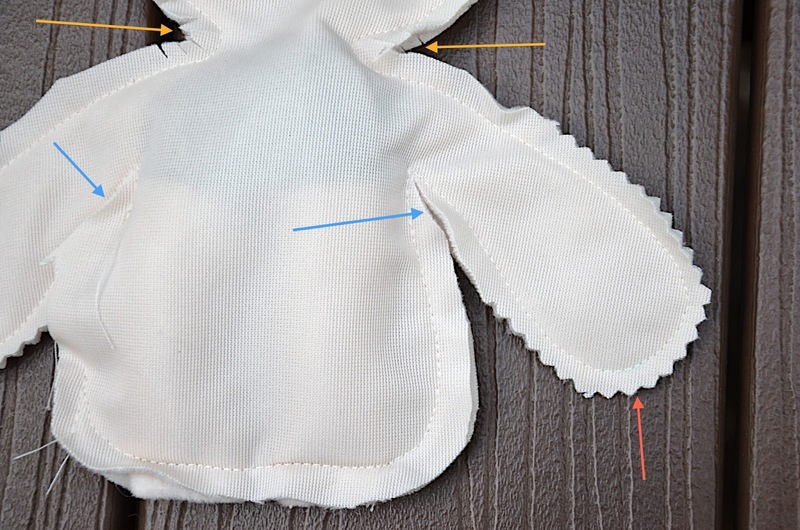 Your doll's arms are integrated into the body piece. 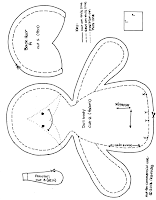 Place the two body pieces together, RS touching, and, with the legs tucked inside the body cavity, sew all around on the stitching line. Leave an opening, about 1.5" long, on one side under the armpit for turning out and stuffing later. small snips the concave bits at the side of the neck (orange arrows) and a single deep slit at each armpit (blue arrows). notch - I used pinking shears - the convex bits around the arms and the head (red arrow). Turn RS out and stuff just the arms. Long-nosed pliers or those hemostat/forceps things really help with this. 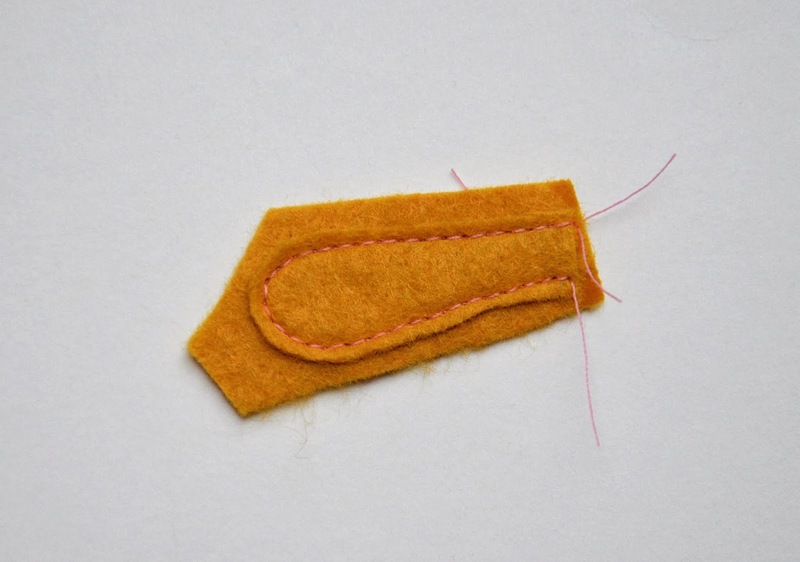 Then sew a line of stitching to define the shoulder. This impersonates the seam that would have joined a separate arm to the body. I used a zipper foot so that I could bunch the stuffing in the arm right up to that fake seamline. It helps to draw the seamline in marker or chalk. 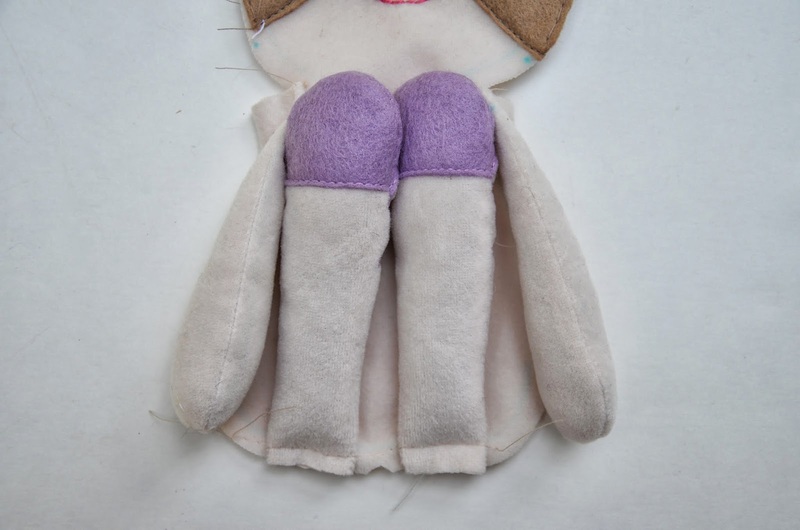 Here is the flat doll with stuffed arms and those fake seam lines. These seamlines will allow the arm to bend and have some movement, as if they were attached to the body the traditional way. Now stuff the rest of the doll. Begin with the head and make sure that you stuff the neck well. To avoid neck creases, don't stuff the head or the chest too densely. Stuff her bottom loosely, then pour in about 3-4 tsp of poly pellets/ beads, aiming for the region of her buttocks (The Contraption will help), and then plug up the rest of her and the opening with more polyfill. Handstitch the opening shut, preferably using the ladder stitch (google that term for tutorials). Add any final embellishments (e.g. 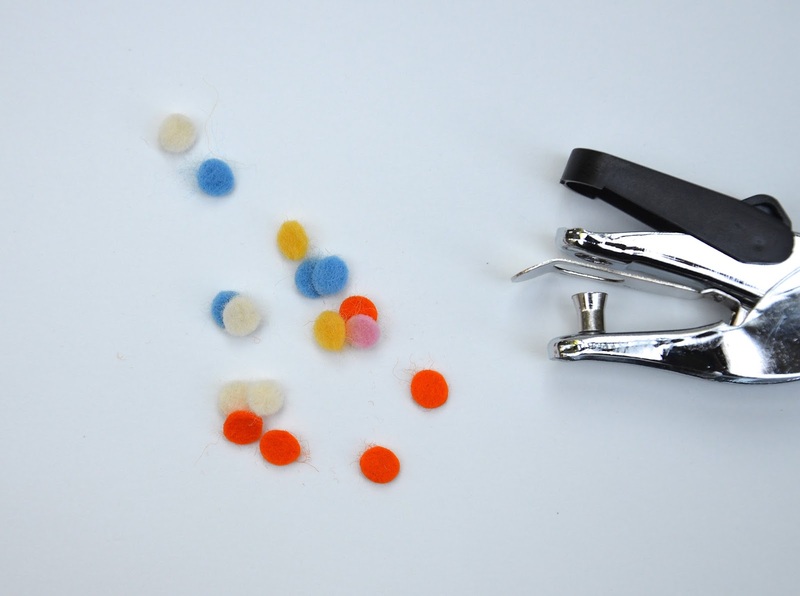 hair ribbons, buttons on shoes -I used a hole puncher to make small wool felt buttons to glue on). Go here for the Dress Workshop! The dolls are so cute! Where do you get the wool felt? It is difficult to find in the shops here in Canada. Lisa: if you're okay with online shopping, try etsy. Just google wool felt and etsy and compare prices. I'd start with buying the 9x12 sheets rather than anything bigger. They're usually less than US$5 a sheet. This way you can choose more colors. The felt is very nice and you can get 10 sheets for $2-3 shipping which is very nice! These are adorable. 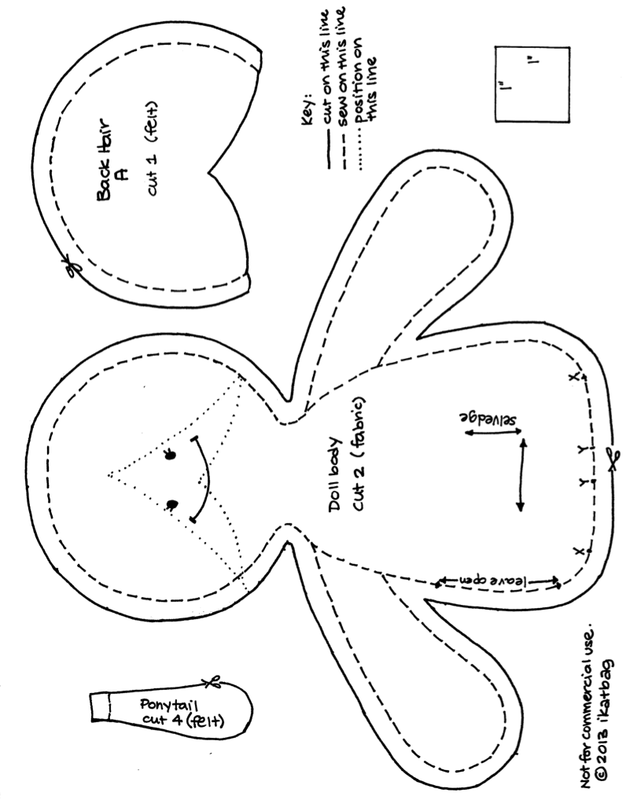 I am thinking I will have to go on the hunt for suitable doll body fabric. Yours is one of my favorite blogs for that very reason - no extra stuff, just pure and amazing inspiration/teaching from you, along with great photos, cute kids, and humor. Thank you! Extreme case in point: I was making Halloween costumes and I decided to go the just-trace-a-tee-shirt-that-fits-your-child route. Everyone is doing it, right? It can't be that bad. It was horrendous! I can barely look at the arm scythe without wanting to tear it off my child. Lesson learned. Leila: about your kid's armscye -I don't know whether to sheepishly apologize or pump my fist in the air. I think I'll go with a sideways hug instead - someday in the future, bras everywhere will thank us for eradicating gaping armscyes forever. One can hope. Sarah! Thank you! I'm going to check it out as soon as I can. I sooooo need it. That was a great link Sarah. I'm only beginning to blog, but it's nice when you find a really easy tutorial to get your template right. Sarah: it worked! Look- this one is number 17! Thank you SO much! Thankyou so much LiEr! I mean: Yes, ma'am! Put us to work! I'm thinking this will be a great first birthday present doll if I leave out the pellets and replace with more stuffing. And then the second birthday I can add accessories. :) Excellent - two year's of presents and one project. Your blog is my favorite , precisely for those reasons - that there are no giveaways , no sponsored content..and it is wayyyy ahead of the others in terms of content - your blog is simply amazing ! I LOVE your blog the way it is so don't change a thing. You have taught me things about sewing I don't think I could learn any place else. Thanks! What a great project. I'd love to tackle this project for Christmas. Love your blog for so many reasons; especially that it is realistic. LiEr, Thank You sooooo much for the pattern. I Love the Doll. Can You tell me what material you used for the body ? I'm not sure what it is. Thanks Karen in Australia. Hello, Karen in Australia! 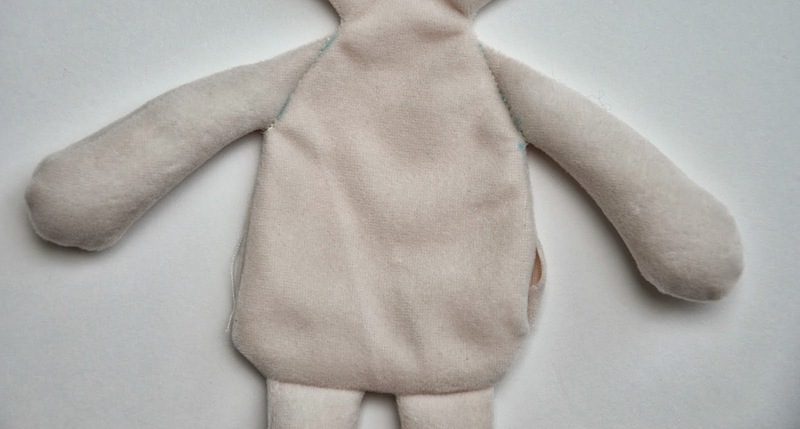 Did I forget to mention what fabric I used for the doll body? Duh. It's a kind of velour - I think this one was called (generically) robe velour. It is a little bit plush on one side, and has no stretch in any direction at all. You can just as well use flannel or muslin or cotton. 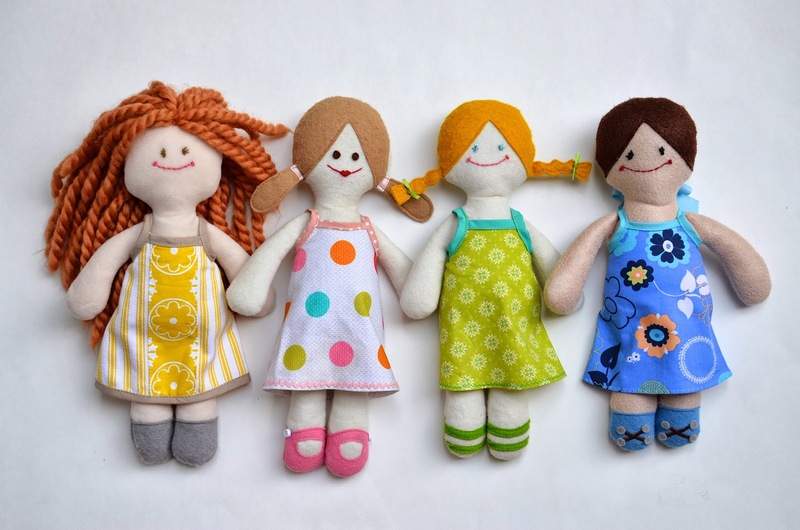 Just avoid knit and other traditional doll-making fabric, otherwise your doll will bloat and won't fit the clothes. 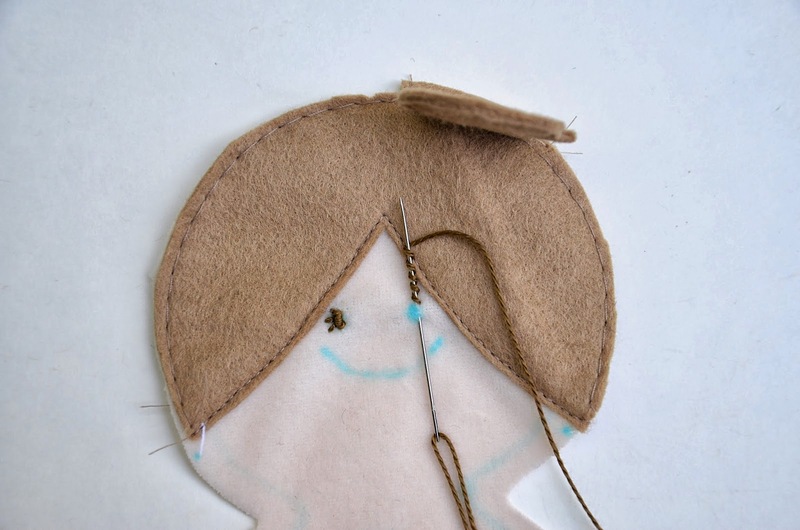 How would you do the hair for a boy doll? I have more boys in my life than girls. Little girls also like boy dolls. Thanks for your help. I have been a silent reader of your blog. I have to say that I love your blog,the wonderful things you create and the awesome birthday parties you have for your kids. You are inspiring.thank you so much for sharing your talent. Love all thetutorials, they are easy to follow and so detailed. Thank you ! I love your tutorials, and this one is so cute. I cannot wait to see your Halloween pictures. 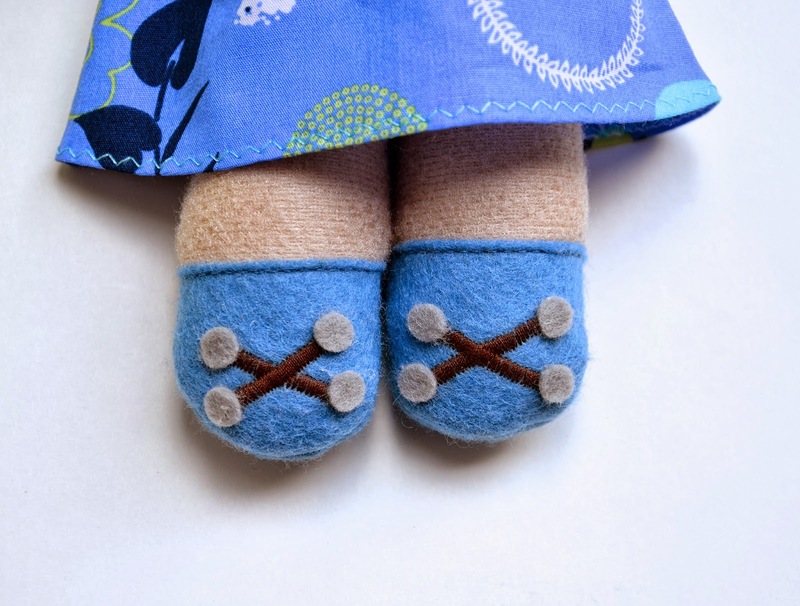 I might be getting a niece soon (or possibly a nephew), and if I do, I now have a baby gift to make. Thank you for this wonderful tutorial. While my own little girl has no interest in a doll like this one (or any doll), she is very excited about the Rapunzel wig tutorial that you posted a while back because I was able to adapt it to make her Mr. Spock hair for Halloween. Can I just say that every time you deliver a party or make one of your incredibly stunningly executed teacher gifts I have to apologize to my kids for failing them yet again. We all laugh as each stage of your incredible parties unfolds in greater and greater disbelief that anyone could make something so wonderful. This latest one was out of this world. Your brilliant tutorials and gorgeous photos belong in a book entitled "Insanely Awesome Parties". And when you have finished putting the book together and doing the book tour you must enter the Great American Sewing Bee when it comes. If you've seen any of the British Sewing Bee episodes you will see that you would be a hot contender. You said it all Clare! Love your blog LiEr!!!! Love your blog even if you don't do giveaways and do insist we work. 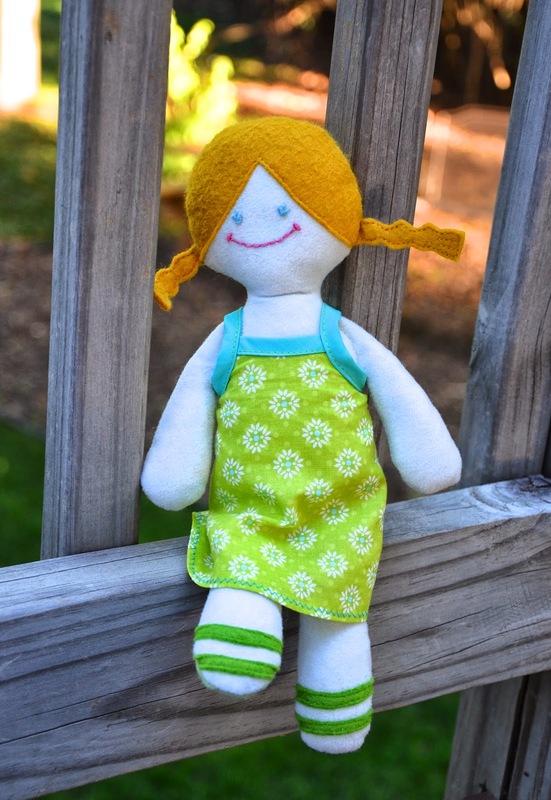 Love this cute doll too but Grandma G got me hooked on AG doll clothes and I'm afraid if I make this doll "for someone else," I'll make clothes, then another doll and more clothes. Quick question - did the face in the Completed Face pic start out with a curl in the middle of her forehead? Annie: it didn't. Or, rather, hers is a totally different hairdo than one depicted in the tutorial instructions. Christel: The stuffing is to make the doll plump. All stuffed animals have it. The poly pellets provide weight to certain parts of the doll-usually for balance. 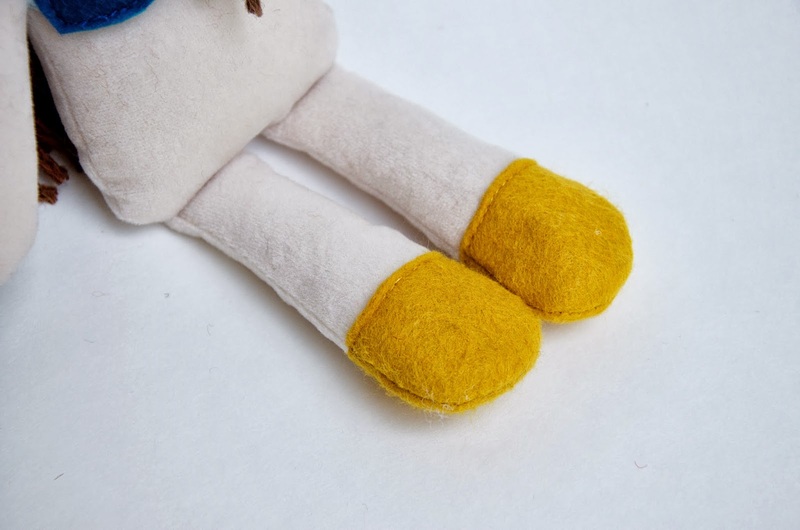 They are commonly put in feet and bottoms, to help dolls sit upright without toppling over. You add poly pellets in addition to the stuffing, and the poly pellets are completely optional. I found your Blog and am totally astounded at what you do for your girls, I can't stop reading your posts, even if I read them not in order. 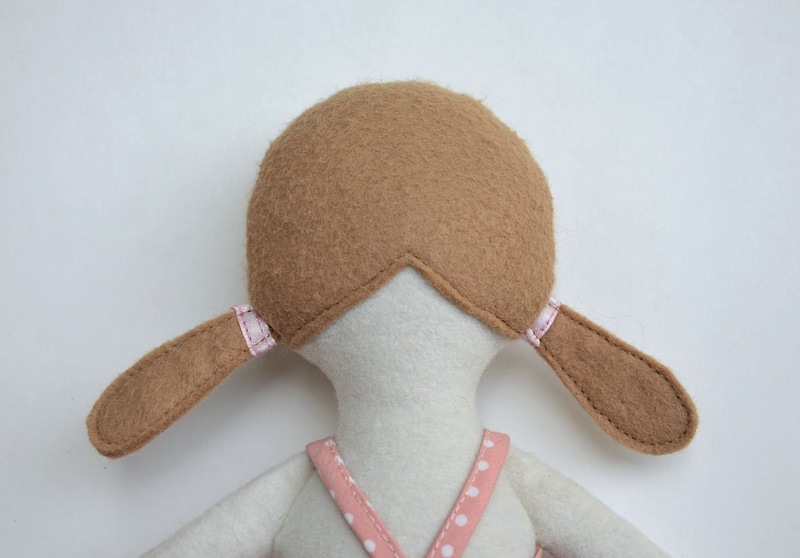 I have to say I found you at the right time, as I want to make a doll for my baby girls first birthday. And yours is one I find really adorable opposed to so many others. I have two questions. Should I skip the poly pellets, since baby is still so young? The second is about the felt, I found one made of rayon, will that work? Or should I keep searching for wool felt? 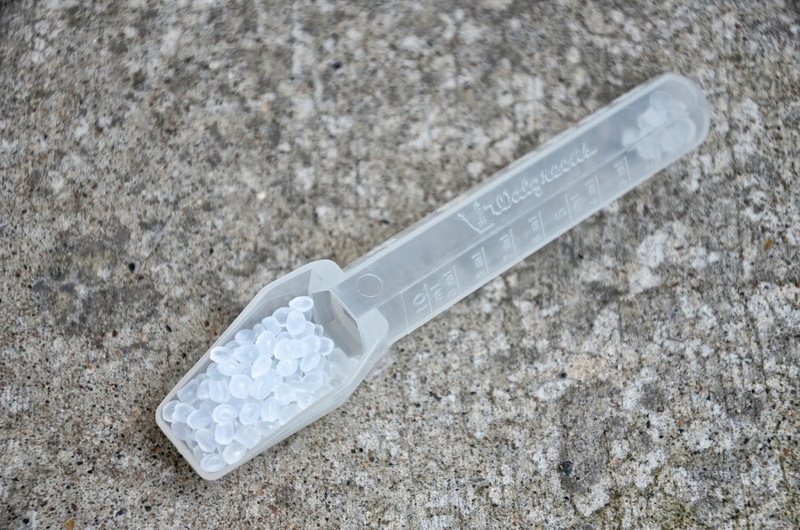 Anerak: The poly pellets are totally optional. They give weight to the doll's bottom to allow her to sit more stably but you can skip them and she'll still be able to sit. About the felt: I'd say go with what you have. Even wool-blend felt also has some proportion of rayon (or something else, but I forget what) in it, and that's okay, too. Felt with some wool in it tends to last longer without tearing or pilling (becoming all furry) over time. Otherwise, it behaves the same way as felt without wool in it i.e. it sews the same way, doesn't fray, etc.